The Vancouver Whitecaps’ Camilo Sanvezzo of Brazil celebrates after scoring a goal against the New England Revolution during a 2013 match in Vancouver, British Columbia. I wrote last week about the vagaries of stoppage time at the World Cup. The referee decides how many minutes to add at the end of each half of play — ostensibly based on how much of each 45-minute half was lost to injury, bookings, goal celebrations and other major delays. The referee doesn’t have to explain the decision, and it can sometimes puzzle fans and rankle teams. Trailing sides think they’re due more time, and leading sides want to get things over with quickly. Researchers have found that more than just time delays influence the amount of stoppage-time allotted. Refs in Spanish club football “systematically favor home teams by shortening close games where the home team is ahead, and lengthening close games where the home team is behind,” Luis Garicano, Ignacio Palacios-Huerta and Canice Prendergast reported in 2005. At the World Cup, only the host — Brazil, this year — truly has a home-field advantage. But in club soccer, home advantage is more relevant, and current data shows it’s not just Spanish club refs who favor the home side. Many of the clubs that enjoy the biggest home advantage in stoppage time play in Major League Soccer, the top U.S. and Canadian professional league. Although some U.S. fans objected to the amount of stoppage time awarded at the end of the U.S.-Portugal match, their domestic league is the club king of home-cooked stoppage time. In all, the data included 1,884 matches in which the home team led by a goal entering stoppage time, and 1,326 matches in which the home team trailed by a goal entering stoppage time. (There are more of the former because home teams win more often than they lose.) On average, the home team gets eight more seconds when it needs more time than when it doesn’t: Three minutes and 59 seconds compared to three minutes and 51 seconds. That’s a 4 percent increase: small, but enough to get the average home team a net gain in goals when it needs them over thousands of matches. The home edge varies widely across leagues. In Ligue 1, it’s somewhat surprisingly reversed: The home team gets 1 percent less time, on average, when trailing by a goal than when leading by a goal. Serie A and the Premier League — despite the fame of Fergie time — are around average. And in the Bundesliga and MLS, the home edge is a whopping 11 percent. 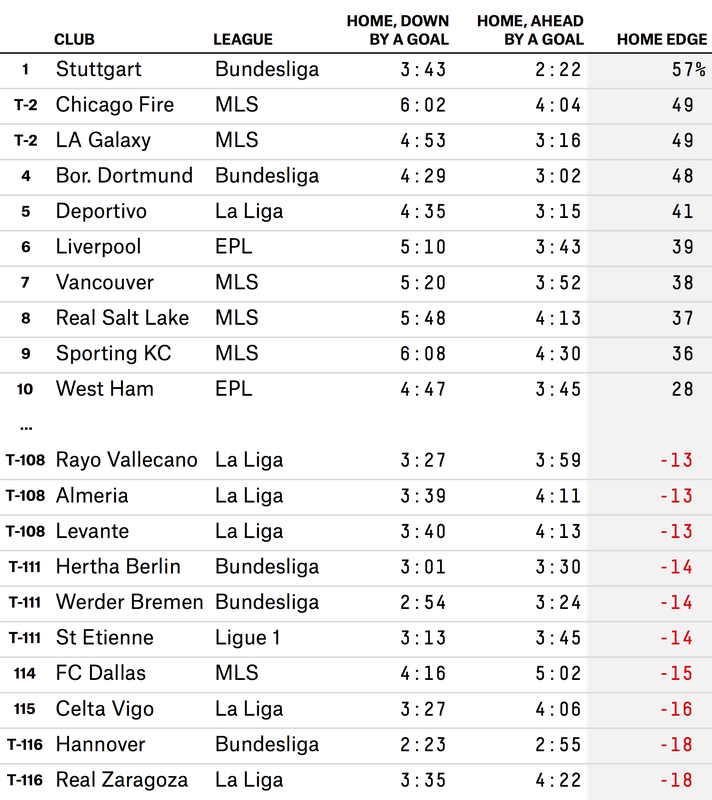 That amounts to a more significant edge in absolute soccer terms for MLS home teams, however, because the average amount of stoppage time awarded is greater in the U.S. club league: Home teams trailing by a goal get an average of 28 more seconds than those leading by a goal in MLS, compared to just 19 more seconds in the Bundesliga. It’s impossible to say over a single match, or a small set of matches, that stoppage-time awarding is flawed: Maybe the game in which the home team trailed did have more disruptions, by chance or because there’s something systematic about such matches that eats more time. But the gap in MLS and Bundesliga, over more than 300 matches in each, is big enough to be suspicious. That doesn’t mean refs are consciously favoring the home side: It’s possible they’re influenced by the crowd or other circumstances without knowing it. Some clubs get an especially immense home advantage at the end of matches. Most of the biggest outliers are in the MLS. Among the 183 clubs studied, 117 had at least five home matches in the sample in which they entered stoppage time behind by a goal, and also had at least five matches in which they entered stoppage time ahead by a goal. Among these 117 clubs, the five with the biggest favorable home edge in absolute terms all were in the MLS. Ranking instead by percentage edge, these same five clubs place in the top nine. They are the Chicago Fire, the Los Angeles Galaxy, the Vancouver Whitecaps, Real Salt Lake and Sporting Kansas City. Garth Lagerwey, general manager of Real Salt Lake, wasn’t surprised by the findings. He attributed them in part to the inexperience of MLS refs. Few have been full-time employees, though their number has increased this season after a lockout, “so they’re right at the beginning of the curve in terms of referee-growth development,” Lagerwey said in a phone interview. The influence of the crowd on refs “shows up in every sport: the NFL, the NBA and soccer,” he said. “The more experienced the referee, the less variation” he’d expect in stoppage time depending on the situation.